The first Ecumenical Synod has decided for the Church the fact that it is allowed and evens well-received in front of God to paint icons. This icons are worshipped but not as God is venerated because it is not right so; for the worshipper it doesn't matter if the icon is made of a certain material or another, what it is only its image as a symbol. That is why the Holy icons are watching over the life of the Christian Orthodox because by blessing and by descending of the Holy Spirit over this pieces of work, they are not simple paintings any more, but they become altars in front of which we get down on our knees and pray the Saints from these icons to help us. Since every cultural object is in some way unique, the conservator's first responsibility is usually to examine and evaluate it thoroughly. After the scientific and technical analysis the conservator establish restoration technique and conservative methods of treatment. The origin of icons has to be searched far in the painting specific to the first centuries of Christianity, especially in Egypt. The tradition of the life-like portrait in Coptic and Egyptian art, so alive and flourishing in the 1st and 4th centuries, was born out of old conception of Hellenistic art and is still renewed by the beautiful portraits from Faiuma and Antinoe. The portrait painted in encaustic, which is wax painting - a technique typical of the very first centuries - are the starting point for the icons which have been paid an ever growing attention in the Byzantine painting of the 6th century. The late Byzantine icon, just like the icons produced within the Romanian and balcanic world of art, seems to be more like an idealised portrait. As a matter of fact, even the Greek term "eicwn" means face, visage, namely portrait  yet a portrait, which doesn't render the physical being but its spiritual side, mirroring a by-world, invisible to physical eye and recognisable only by the spirit. In rendering characters or religious scenes, the icon doesn't imitate the human shape, the embodiment of it being denied by Christian dogma. Body and flesh are two distinct things from an orthodox point of view; therefore, it might be possible to present the body without imitating the shaping of flesh. The image of the saint profits by its sanctity substitutes itself for the saint, therefore acquiring every feature of the latter . The icon is exceptionally identical to its model, although its nature is different altogether . Preserving this connotation, in Old Romanian texts, we come across the word "face" and "to face" ("visage" and "to envisage") used to name the icon and the action undertaken by the artist in order to produce it. Unlike wall painting, which is conditioned by the architectural shapes of the monument embellished by it, the icon is a work of art existing irrespective of the light and the environment where it was made. That is why it has to have a light of its own, provided by the gold background. Just like easel painting, it is meant to be admired closely, displayed in a niche, on a table or an altar, at average eye level. That is the reason why the painter is specifically asked for flawless accuracy in rendering details. He uses precious materials, warm tones being vibrated against a golden background providing the icons with that glow specific to enamel or mosaics. In point of content, the icons were obviously different from wall painting in its first stage, the latter being mostly narrative and illustrative. Due to their dogmatic character, icons represented the portrait of Jesus Christ, Mary and the other saints, tending to detach from the text, gradually idealising the historical image . Each and ever icon is linked to a historical and artistic, highly remote prototype . In other words, the icons stand for one of the most important documents, which, beyond the artistic value, accounts for schools and arts millieux, historic personalities, connections with other people and countries, through their ideated contents and technical execution. The history and evolution of icon painting is connected to the history of Romanian church, its developing stages and the influences, which were inferred upon it . The inscriptions are in Church Slavonic displayed on the lateral sides of the compositions. Optical Emission Spectrometry is a quantitative comparative analysis technique, used to determine materials chemical composition. The principle is based on fact that excitable atoms (when they acquire sufficient energy to emit their characteristic radiation through inelastic collision with other atom, molecules or ions, for this, the atoms have to be in a gaseous state) emitting this radiation energy in a discrete wavelengths that is selected and measured. Spark and arc excitation sources uses a current pulse (spark) or a continuous electrical discharge (arc) between two electrodes to vaporise and excite analyse atoms. The electrodes are either metal or graphite. If the sample to be analysed is a metal, it can be used as one electrode. For our purpose we used the mobile optical emission analyser ARC-MET 900. The versatile ARC-MET 900-analyzer combine's ease of use with high performance features, to give reliable and accurate on-site analyses of different metal samples. ARC-MET's measurement is based on vaporising a small amount of sample and analysing sample's elemental components from the vapour. The excitation chamber is made of a special ceramics and contains a tungsten electrode. An electrical arc is ignited between the electrode and the sample to produce light, which is then measured to give analytical results of the sample. The chamber is flushed with argon, which takes the metal fumes produced by sparking to the exhaust fumes filter. To ensure best possible results we have to take appropriate care of sample surface as analytical results depend on the sample surface condition. We put the sample into a sample holder and grind the surface (approximately 3 cm/4 cm) with grad 40-60-sand paper. After this we transfer it in the excitation chamber. We must not touch the sample surface after grinding. Fingerprints on the sample surface will affect the analysis. Any contamination on the sample surface will spoil the representatively of the sample. The measurement began by filling up the excitation chamber with argon to prevent sample oxidation. A high-frequency excitation (1-30 seconds) is used to prepare the sample surface for analysis, follow by a 10 seconds burn, the phase when the line intensities of the elements are measured. At the end argon afterflow is used to cool the electrode. Table 2: Results of chemical analysis performed on 18th century's triptych. As a result of the metallographic analysis (figure 2) presented above we can infer that it belongs to a Cu-Zn alloy (Cu = 77.93% and Zn > 3.85%). the phase h - terminal solid solution of Cu in Zn with a compact hexagonal net. The brass whose chemical composition has been presented belongs to the category of types of brass with less than 20% Zn and it is called tomback. These kinds of brass have a high degree of plasticity due to the fact that they contain the phase a, which crystallizes in the cubic net with aCu centered sides and in this kind of net plastic is prevalent. The types of brass with less than 50% Zn became very fragile because of the intermediate phase g and e and they become fragile to such an extent that they can no longer be used . The variation of the mechanical properties of brass has been established depending on the Zn concentration and is presented in figure 4. 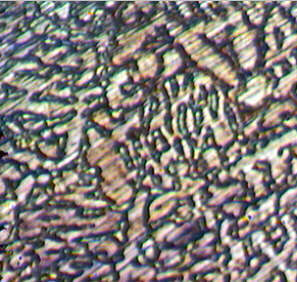 Fig 2: Image provide by an optic microscope of the triptych made by red tomback; ferric chloride attack; moulding structure is dendrite and a monophasic. Fig 3: Copper - zinc diagram. The best plasticity is obtain for the types of brass aCu with 30% Zn (see figure 4 showing a relative lengthening of 60% and the highest degree of resistance which are obtained at 42 - 45% a(Rm = 45daN/mm2), and the maximal toughness where moulded belongs to the phase g at 60% Zn which has, in exchange, a minimal resistance (resistance to bending through shock). The presented brass belongs to tomback category (with Zn < 10%) and it may be called red tomback (as it can be seen in the metallographic analysis, figure 2). 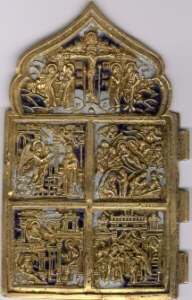 The mechanic features and characteristics of this type of brass are presented below. This tomback has only one phase as a main component - the phase a (therefore it is a monophasic a brass) and the structure we have presented is dendritic and has been obtained after a moulding process. The dendritic ensembles provide it with low mechanic proprieties. This structure, characteristic of a nonhomogeneous solid solution may be made homogeneous by re-baking and then deformed into stripes, wires, bras etc. C. Nicolescu, Icoane vechi romanesti, ed. Meridiane, Bucuresti, (1971), 7, 8, 19, 20. I. Dancu, D. Dancu, Pictura taraneasca pe sticla, ed. Meridiane, Bucuresti, (1975), 22, 126. K. Popaioannu, Byzantiniche und russische malerei, ed. Rencontre, (1966), 34. I.D. Stefanescu, Icoane de arta in Moldova, M.M.S., (1959), XXXV, 9-12, 590. M. Porumb, Icoane din maramures, ed. Dacia, Cluj-Napoca, (1975), 5-6. J. Christian, Phase transformation, ed: Physical Metallurgy, North-Holland, Amsterdam (1965). John C. Taylor and Heinrich R. Traulsen eds, World Survey of Nonferrous Smelters (1988).